There’s always that moment when you’re watching an old movie, or TV show, and a shot comes up of New York City and the Twin Towers, rising proudly over Manhatten. For me, and I imagine for most Americans, the heart misses a beat. A breathe is held. A pang of pain and sadness quickly takes over. Even after twelve years, the shock and disbelief of 9/11 still jars. And every September since 9/11/11, we, as Americans, once again grow nervous, a little anxious. We’re not just nervous about the threat of another terrorist attack; sadly, we are nervous about how we will react to each other on this day of national remembrance. This year, the weeks and days preceding 9/11 were hijacked by two planned events: the Million Muslim March (later called the Million Americans Against Fear), and, in response, the Two Million Biker Rally. Not just any bikers. Patriotic bikers. Patriots, in fact. Meanwhile, best described as a fringe group, the Missouri-based American Muslim Political Action Committee (AMPAC) scheduled the Million Muslim March for Sept. 11, 2013, to commemorate the attacks of Sept. 11, 2001, but the same group refuses to attribute the 9/11 attacks to Islamic extremists; instead, AMPAC’s focus is on discrimination against Muslims. 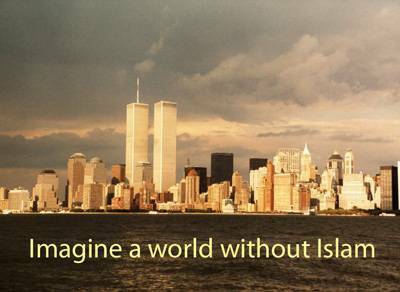 In reality, AMPAC is driven by the ignorant, hate-mongering of a “9/11 Truther,” M.D. Rabbi Alam. Nationwide, Muslims have denounced both Rabbi Alam and this march; even CAIR (Council on American-Islamist Relations), one of the most prominent American Muslim organizations, has spoken out against this so-called rally for peace, and Dr. Zuhdi Jasser, president of the Islamic Forum for Democracy, denounced the protesters as “a bunch of truthers who think that America’s to blame for everything.” Predictably, the thousands of Muslims denouncing the March are drowned out by the hysteria created by the conservative media outlets, and, to be fair, the underserved media time on the not so conservative — CNN, NBC, CBS. As is often the case with news, but is most certainly the case with this news, the rally wouldn’t have received any attention whatsoever if the media hadn’t made a “mountain out of a molehill.” In fact, today we know that less than 100 marchers turned out for the Million Muslim March. Yes, they were only short some 900,900 folks. And that’s a generous estimate. And the Two Million Bikers?? Estimates range anywhere from several thousand, to, well, several thousand. I’ll concede they outnumbered their “enemy” by many to one. In my humble opinion, neither one of these “causes” was worth air time. But giving them air-time, and consequently, “legitimacy,” then fueled all of the supporting fanatics to add to the cacophony of hate talk. Pictures such as there were readily found on FB. My first visceral and visual response to this particular picture was…. On April 19. 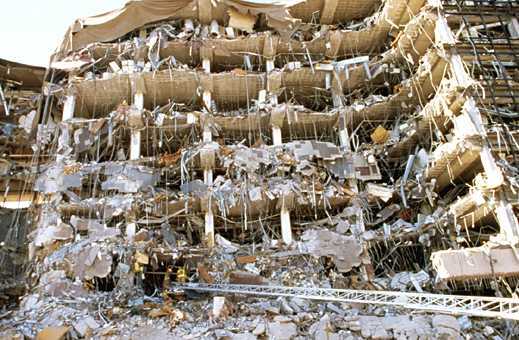 1995, Timothy McVeigh detonated a truck bomb, outside the Alfred P. Murray Federal Building in Oklahoma City. Prior to 9/11, the Oklahoma City bombing was the deadliest terrorist attack on American soil, killing 168 and injuring another 600, many of whom were children. Both of these acts of terrorism, on American soil, were perpetrated by fanatics. Timothy McVeigh had his own co-conspirators: Terry Nichols, and Michael Fortier (all “Christian”). The four separate acts of terror carried out on 9/11 (two planes flown into the Twin Towers, a third plane hit the Pentagon, and a fourth plane crashed in a field in Pennsylvania) were all planned and orchestrated by “Islamic” terrorists, primarily from Saudi Arabia, and financed by al-Qaeda (Osama bin Laden). In both scenarios the terrorists clung to their “faith” driven acts of barbarity. These aforementioned men have several things in common: they’re fanatics, and they’re terrorists. While they claim the faith of Christianity, or Islam, in practice they are neither. Surely this is not hard to comprehend. Yet, as Americans, we are far better at believing this of Timothy McVeigh than we are of the other 19 hijackers who terrorized our nation on 9/11. For, let’s face it, if Timothy McVeigh’s version of Christianity really did represent the tenets of the faith, then all of the history and values of this country would crumble–they simply wouldn’t be Christian and we’d be looking to rewrite our history books. Any Christian recognizes this, and even an Agnostic such as myself can understand that Timothy McVeigh, no matter how much he self-proclaimed it, was definitely NOT a Christian. At least in terms of what Christ represented and propagated. So why can’t we use the same logic for our Islamic brothers, sisters, and friends, many of whom are: first, second, third generation “Americans?” Why can’t we see the difference between 19 fanatics, who, hijacked not only the four American planes that fateful 9/11, but also hijacked the faith of “Islam,” in order to carry out horrendous acts of terror in its name — and the true faith of Islam, itself. The purpose of terrorism is both tactical and strategic, and its purpose is to inculcate fear. We often talk about not letting the terrorists win. 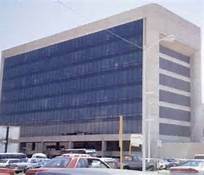 So, we rebuild the Murray Federal Building in Oklahoma City, and we build the “Freedom Tower” in place of the Twin Towers. These buildings symbolize so much more than bricks and mortar; they symbolize the strength of America’s spirit–unbroken by even the most horrendous acts upon her. But, frankly, we are not so good at fighting the internal, systemic fear and propaganda that imploded on 9/11. Each year, we get hijacked all over again by ridiculous news stories, about insignificant events, designed, it would seem, to do nothing more than agitate Muslim/Christian relations. Until we cease this yearly reaction, until we embrace the cultural melting pot that is truly unique to America — Christian/Muslim/Jew/Hindu/Atheist and so forth, well, the terrorists kinda have won. Thanks for writing this, Nikki–so much truth and wisdom in your balanced insight. One of the problems with living outside the US may be the fact that I had heard about neither of these events–but, perhaps, that’s for the better! Great post, my friend. Thanks, Kathy. I’d be interested to how 9/11 is reported in places such as Ecuador. Amen, my friend! And beautifully written, of course! Thanks, Cassie, and I’m awaiting your blog on American Gothic farming!